So the flight on Jetstar to Thailand is definitely an interesting collection of people... My personal favorite was old mate who's headphones were so loud you could hear the music from 5 rows back! And what was he listening to? ACDC of course!!! Many other interesting characters have also been identified and we've only been in the air for an hour so far. I think another old mate has been in and out of his original seat and the spare one he claimed at least 20 times already. I call him old mate seat hopper! 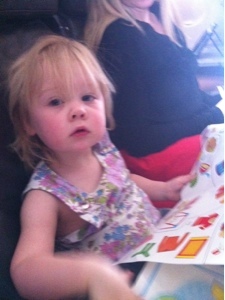 On a more positive note Charlie seems to be enjoying her sticker book. So far so good.